Trigonometric identities (trig identities) are equalities that involve trigonometric functions that are true for all values of the occurring variables. 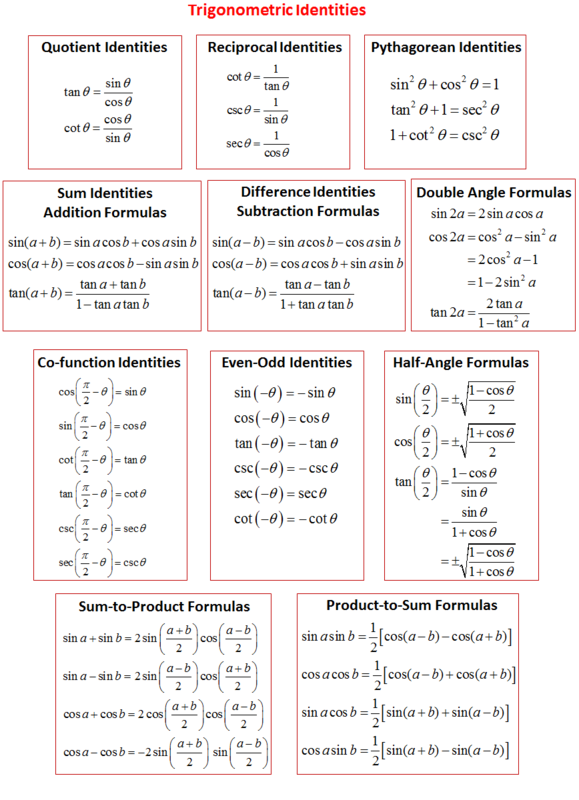 These identities are useful when we need to simplify expressions involving trigonometric functions. The following is a list of useful Trigonometric identities: Quotient Identities, Reciprocal Identities, Pythagorean Identities, Co-function Identities, Addition Formulas, Subtraction Formulas, Double Angle Formulas, Even Odd Identities, Sum-to-product formulas, Product-to-sum formulas. Scroll down the page to learn how the different Trigonometric identities are derived and how they may be used. This video shows how to derive the Quotient, Reciprocal and Pythagorean identities. This video explains the cofunction identities and how to determine cofunctions given a function value. This video explains how to use cofunction identities to solve trigonometric equations. How to use the formula for the cosine of the sum of two angles to derive the formulas for the cosine of the difference of two angles, the sine of the sum of two angles, and the sine of the difference of two angles? Examples using the formula are provided. How to use the sum and difference formula for cosine to find exact values of non-special angles? More examples of using the sum and difference identities to find value other trig values. Starting with the cofunction identities, the sine addition formula is derived by applying the cosine difference formula. There are two main differences from the cosine formula: (1) the sine addition formula adds both terms, where the cosine addition formula subtracts and the subtraction formula adds; and (2) the sine formulas have sin-sin and cos-cos. Both formulas find values for angles. How to Prove the Addition and Subtraction Formula for sin(x+y) or sin(x-y)? Formulas to Prove Identities: Applying the cosine addition and sine addition formulas proves the cofunction, add π, and supplementary angle identities. Using the formulas, we see that sin(π/2-x) = cos(x), cos(π/2-x) = sin(x); that sin(x + π) = -sin(x), cos(x + π) = -cos(x); and that sin(π-x) = sin(x), cos(π-x) = -cos(x). The formulas also give the tangent of a difference formula, for tan(α - β). How to use the sine and cosine subtraction formulas to prove the cofunction identities? How to use the sine and cosine addition formulas to prove the cofunction identities? The double angles sin 2θ and cos 2θ can be rewritten as sin(θ + θ) and cos(θ + θ). Applying the cosine and sine addition formulas, we find that sin 2θ = 2sin θ cos θ and cos 2θ = cos2 θ - sin2 θ. cos 2θ = cos2 θ - sin2 θ. Combining this formula with the Pythagorean Identity, cos2 θ + sin2 θ = 1, two other forms appear: cos 2θ = 2cos2 θ - 1 and cos 2θ = 1 - 2sin2 θ. How to use the sine and cosine addition formulas to prove the double-angle formulas? The derivation of the double angle identities for sine and cosine, followed by some examples. How to use trig identities to rewrite trig expressions? The half angle identities come from the power reduction formulas using the key substitution α = θ/2 twice, once on the left and right sides of the equation. With half angle identities, on the left side, this yields (after a square root) cos(θ/2) or sin(θ/2); on the right side cos 2θ becomes cos θ because 2(1/2) = 1. For a problem like sin(π/12), remember that θ/2 = π/12, or θ = π/6, when substituting into the identity. The derivations of the half-angle identities for both sine and cosine, plus listing the tangent ones. Then a couple of examples using the identities. How to use the half-angle identities to determine function values?